blog so you won’t miss anything! Also make sure you collect all the “secret” words on each blog so at the end of the hop you can send in the phrase to enter our drawing for a wonderful treat. So sit back, relax, take your time and enjoy the hop! · First is the Kit Club for each month for an entire year. This is exclusive sets for club members which include a paper set, stamp set, and collage images in each set! That is 12 different sets! This is a $144 value! · Second prize is the monthly collage sets for an entire year! Each month you will receive all 4 sets absolutely FREE! This is a $96 value. · Third prize is all of the individual collage sheets each month for a year, this includes the jewel it sheets! This is a $90 value! · And our Grand Prize ONE FULL YEAR of Gecko Galz PRODUCTS!!! That will Kit Club Set, 4 individual collage sheets, Jewel it set and 4 collage sets each month for the entire year! This is a prize worth $330! Read on to learn how you can win! First of all, you will need to visit all 21 blogs and leave a comment on each blog :) **This is important so we know you have been to all the blogs **. 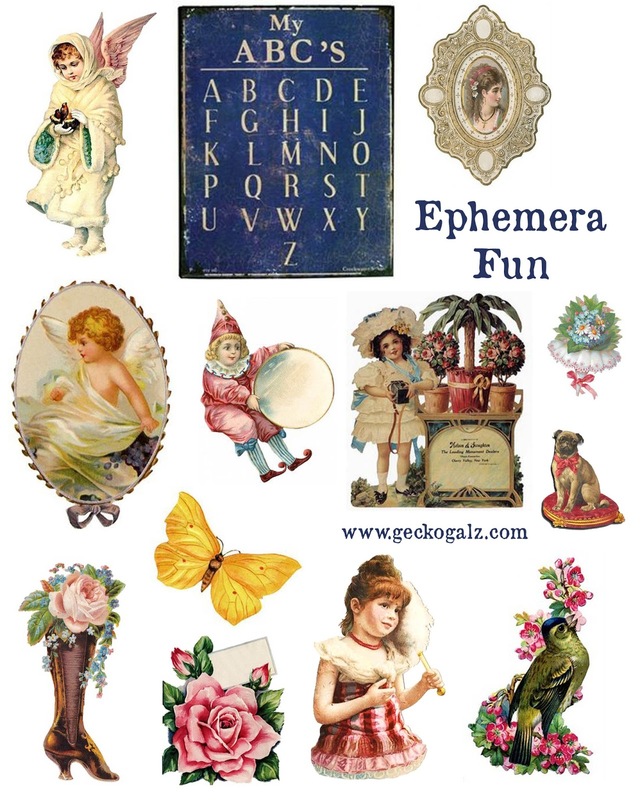 Collect all 20 words (one on each blog site except the home site) and at the end of the blog on the Fripperies and Butterflies site there will be a link to email the phrase to Gecko Galz. This enters you in the contest. On November 3rd we will randomly draw the 4 winners and email each of you, then we will post the winning names on the Gecko Galz blog site. as well as the samples I have made using the images! Or you can click here for full size. First up is a card that I created using a few of the images on the free sheet above. I have also used the Gold Alphabet Text Boxes from my Autumn/Fall collage sheets set which you will find the 5 sheet set (red, gold, brown, orange, black) in my Etsy here for $8.00. 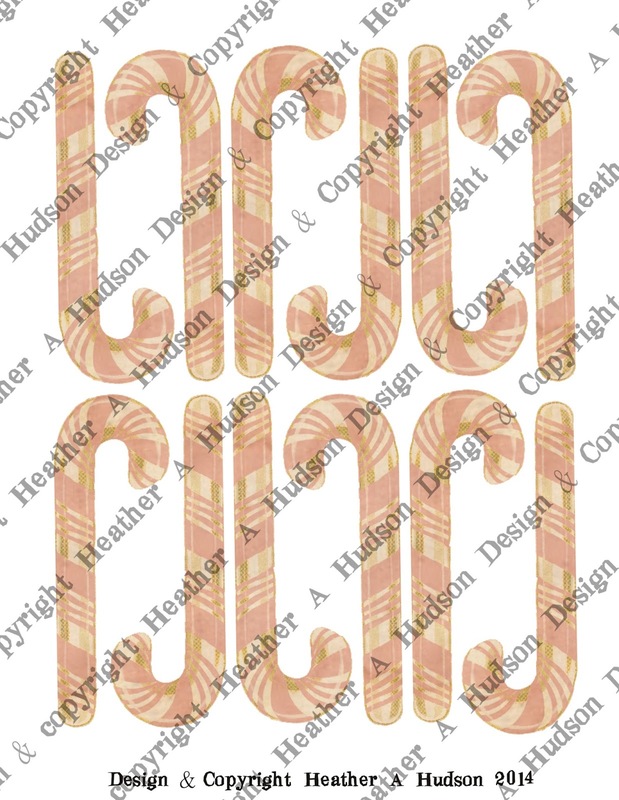 Up next is a Tag that I made using some of the same images. Hello Friends!! I hope you are having a fabby day! Today I would like to share with you a Spooktacular Coffin Card that I made for inspiration for our Anything Goes Creative Cutting Challenge!! You can link up your project as long as you use an SVG file. I started off with Cindy's Coffin Card SVG Set. You can get it for $2.00. Here is a look at the set below. You get four different coffins and the coffin card base. I used the solid coffin piece in the lower right cut out of black card stock and the base out of ivory card stock. Here is my Spooktacular Coffin Card Below. I used a couple of my digital Collage sheets from my Etsy. 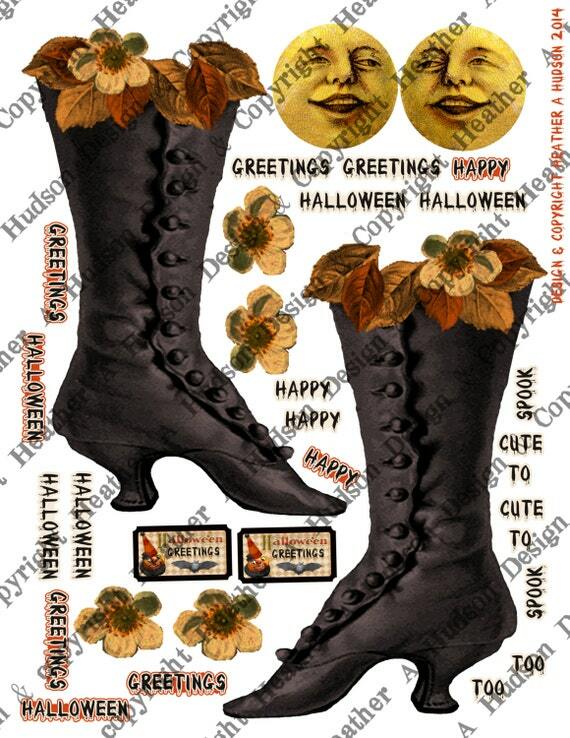 Halloween Witch Boot , and Halloween Playing Cards, Here is a close up below. I used the tiny bat from one of the coffin cards cut of black card stock. I used tombow foam tabs, orange gingham and orange seam binding from Really Reasonable Ribbon. Creative Cutting Anything Goes Challenge!! I hope you are having a fabby Sunday. 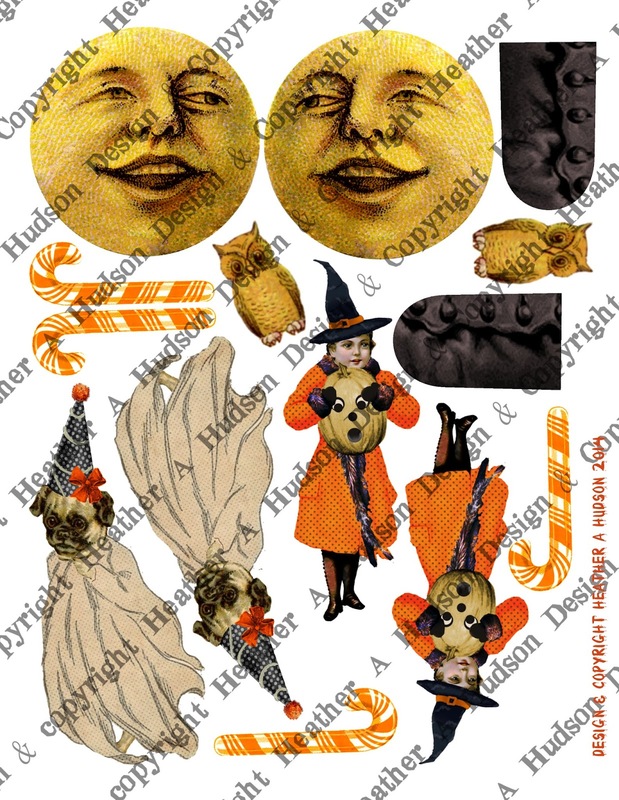 Halloween Witch Circle labels, Witch Boot, Halloween Playing Cards and Halloween Tickets Digital Collage Sheets that I designed. I used Some Really Reasonable Ribbons and Trims as well as Art Glitter. I used my circle card base on top of my scalloped tag base. Here is the tag open. I layered more of my images onto a round doily that I inked with Ranger's Frayed Burlap. My Artistic Adventures Challenge Blog. Today I would like to share with you another Halloween Scalloped shaped card that I just threw together in 10 min. (as in 10 minutes ago, trying to get my post done by 9am so it can be delivered by email today). I thought I would go with a lighter color cardstock base. I used my Scallop Circle Card SVG. I also used two of my Digital Collage Sheets. 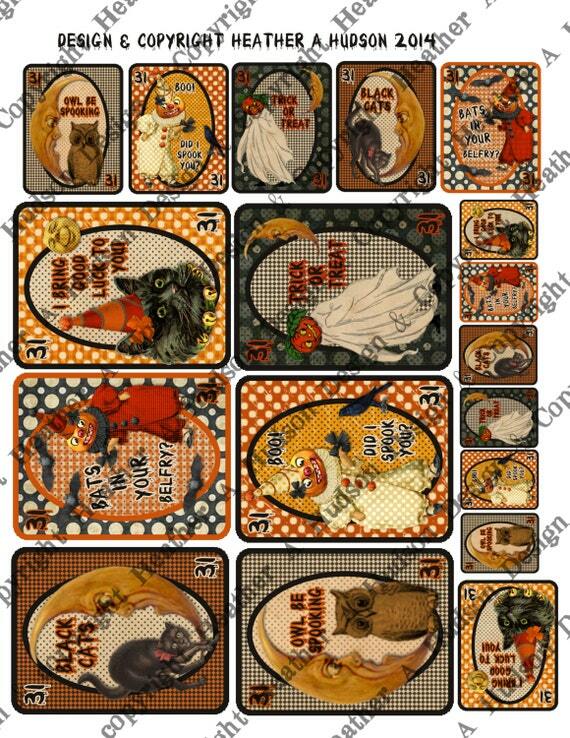 Halloween Tickets and Halloween Witch Labels, just follow the links to my Etsy shop. I used some orange and deep ivory mulberry roses from RRR as well as the orange leaves, seam binding and Halloween Baker's twine. I used Pumpkin, Storm and Halo Art Glitter and Designer Dries clear glue. If you missed my first Scalloped Card you can see it here. Today I would like to share with you a Scallop card that I made using a couple of my new collage sheets. Looks Spookilicious..and didn't take me that much time to create! I used my 2 page Witch Boot Set for the orange candy canes and moon image. which you can find in my etsy here. 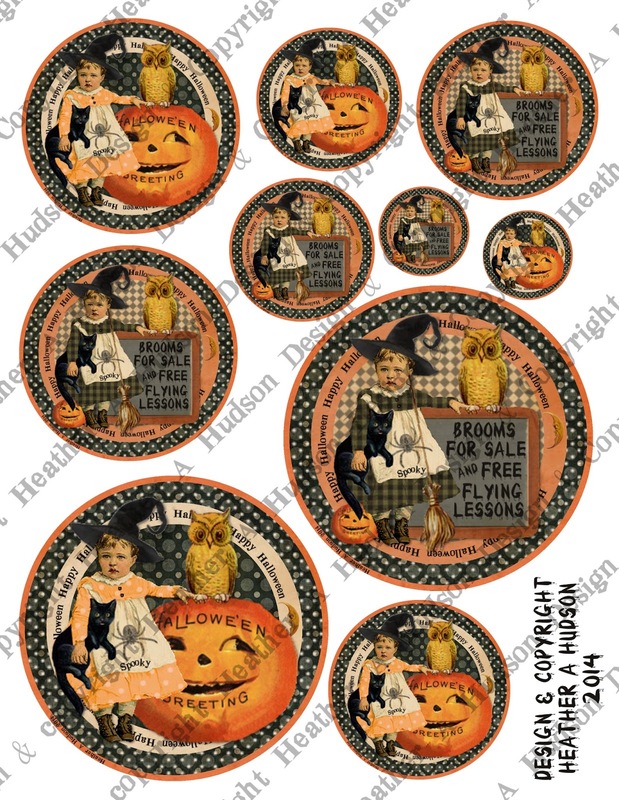 I also used my Vintage Witch Halloween Circle Labels which you can find in my Etsy here. Tombow Foam Tabs were used to Elevate my main image and my tiny moon image as you can see below. I just love my little cluster of Orange and Dark Ivory Mulberry Roses and Orange Seam binding from Really Reasonable Ribbon, paired up with some seed beads and my candy canes! Darling!! Here is a close up of the other side. I used another Orange Mulberry Rose, a button tied with Halloween Baker's twine as well as another Candy Cane and a Moon image! Of course I used Art Glitter through out! I created my own Scallop Card SVG. I have to laugh because after I was all done...I decided to go back in and change it...lol! So the next card I make will be with the new SVG. We have a new Creative Cutting Challenge (Must use SVG File) Halloween Theme! I can wait to see what you Create and Link up! Lunagirl Moonbeams: Put a Bird on it! I hope you are having a fabulous Sunday! This is the first Sunday that I have had in a while where I did not need to volunteer for something through Scouts, Venture Crew or Tennis. So I thought I would play around with some images. You can find it in my Etsy $5.00 here. I have used my favorite Little girl image that originally found at Karen's the Graphics Fairy's website. I changed up the color of her dress and apron, added some images and text to her apron and gave her a witch's hat. I just LOVE this little image. 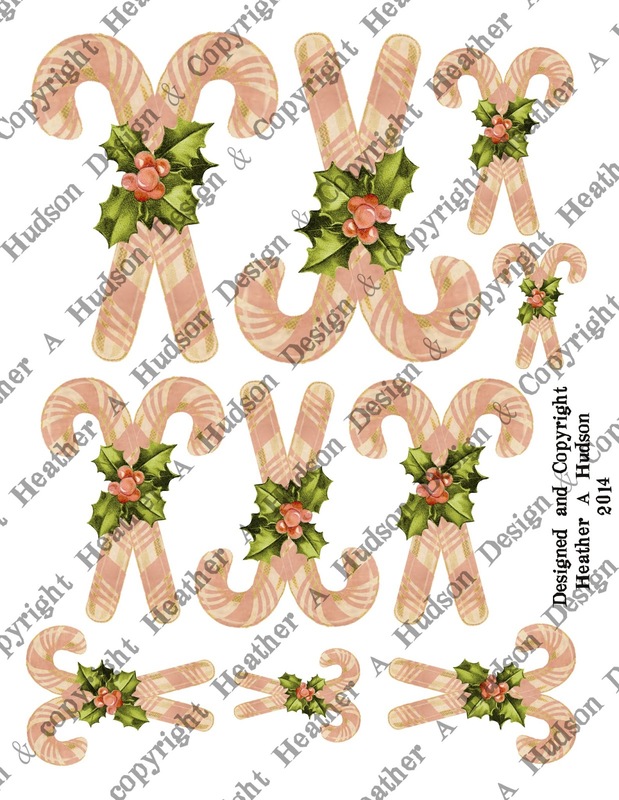 Pink Shabby chic Candy Canes with Holly for Christmas which you can find for $4.50 in my Etsy Shop here. 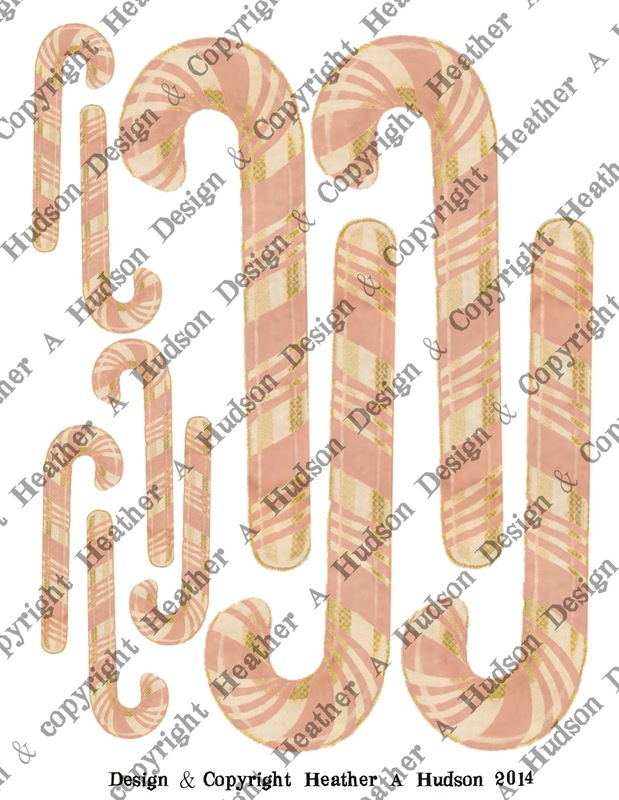 They are similar to my Traditional Red Candy Canes I did last year. Design Team Call going on right now and an "Anything Goes Challenge" going on over at my Challenge Blog! In case you missed my post yesterday, I have a new challenge and Design Team called posted on my Challenge Blog. Yesterday I had a little time to play after I got home from both of my boy's tennis matches. I created this Halloween Treat using some fabby ribbons and trims from Really Reasonable Ribbon. I started out with my Vintage Halloween Boot Digital Collage Sheet set which you can find in my etsy here. First I cut out all of my pieces and inked the edges with Ranger's Frayed Burlap. I glued the fronts to the backs, and then inked the edges :0) I added some Tombow foam tabs to the upper portion of my Halloween Boot and the boot pocket piece. I added glitter to all of my pieces. You may recognize Pugsley and the little girl from my Shabby Chic Pink Christmas Mitten Ornament. You will see here that Pugsly is dressed in a Ghostly Clown costume and the little girl is dressed as a witch and holding a pumpkin. I tied a bow with Old willow Organza on my moon image. I used a couple of orange pom poms on Pugsley's ghost costume. I used 1/4 inch natural lace, orange leaves, Chocolate brown seam binding, Halloween baker's twine, Orange and Deep Ivory mulberry roses on the tiny pocket of my Witch boot. I tucked an owl and orange candy cane into my boot pocket. I used some more Tombow Foam Tabs under my text boxes. At the top of my boot I have added an additional flower image with foam tabs as well as the "Halloween Greetings" image. I used some more of the orange leaves, some orange baker's twine and another deep ivory mulberry rose. One last look at the whole piece. Anything Goes using my images, you can link up your creations using my images here. Craft Hoarders Challenge: School Supplies (paper clip & whole punch). I hope everyone is enjoying their week! Just visit one of the links above (they take you to the same post) to find out more about my challenge and Design Team Call.